Here is another illustration I have worked on with Toma Alin Gabriel. Worked on this piece with a lot of images and I would also like to thank the photographers for giving us permission to use their stuff. In this tutorial, we will take you through the process of creating a fantasy scene, make water pour out of a painting, make some sort of a absorption effect and end up with a really nice looking color. The main idea behind this surreal illustration is that we are actually in a painting and the painting on the wall is the real world, the world where our vulture tries to escape. 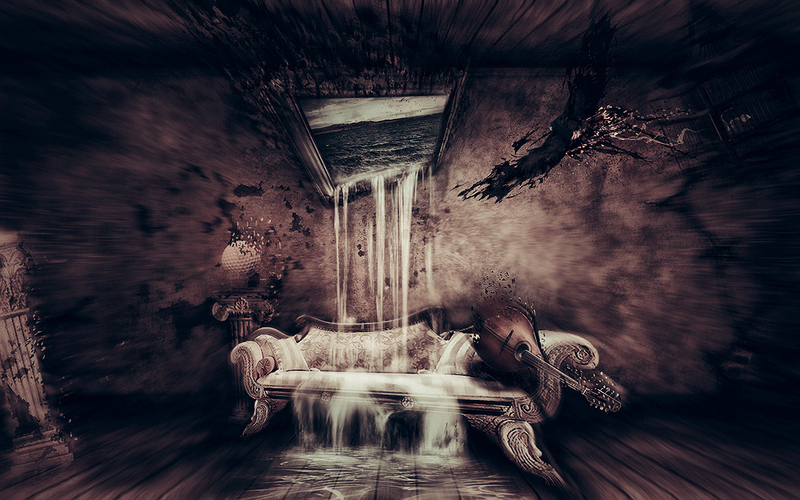 Before you start take a look at the images we'll be using: Bird Cage by Marcus J. Ranum, pedestals by Marcus J. Ranum, couch by Tattoomaus78, Vintage Mandolin by fotovizions, Old Dark Room by Geek-Stock, Wooden frame by Geek-Stock, Vintage Grunge Texture by Anne, Waterfall by xPhate, Water by RosalineStock, texture by cgtextures, painting by night-fate-stock, Harris Hawk 3 by sxc, golf ball by sxc. Open the Old Dark Room image provided by Anne. This room looks pretty freaky already but you want it to have more cracks. To do this, import the Vintage Grunge Texture and resize it using Command + T.
Set the texture layer to Multiply and erase the edges using the Eraser Tool (E) so that it blends in. Also, you will need to use the Burn Tool (O) on the image to darken it some more, and then desaturate the image to obtain a better result. The texture will blend in just perfectly. Import the frame into the scene and cut it out of its background using the Pen Tool (P). Select some parts of the frame and using (Command + J), duplicate them. Next, enlarge the frame. After you place each layer into place, merge them all together. Using the Clone Stamp Tool (S), clean up the frame so that each piece you have create will blend in with the others. Now that you have your frame ready we need to add some color effects. Change the Hue/Saturation to: Hue -25, Saturation -60 and Lightness 0; Levels to 17, 1.00, 255; Vibrance to -26 and Saturation -53. Follow the images below for reference. Now that we have set the frame color, we need to make some serious cracks on it. For this you will have to use a cracked texture that you can find on cgtextures. Set the texture over the frame and set it to Overlay and Opacity 50%. Cut the texture layer so that it is only over the frame or simply make a selection of the frame and mask the texture. Duplicate the layer two times. In the end merge the crack with the frame and add some final adjustments: Brightness/Contrast 0, -40 and Exposure -0.80, Offset 0.0000, Gamma 1.00. Next you need to add a picture in the frame and create a painting. For this use the image created by painting by night-fate-stock. Position the image behind the frame and rotate it a little bit. Apply some Vibrance adjustments to the painting: Vibrance 26 and Saturation -30. Merge the painting and frame. Now use the Transform Tool (Command + T), then chose Distort to pull the corners of the frame to create something like in the image below (you need to give the impression that some force is absorbing from there). Set the Exposure to -1.00 and for the Color Balance Midtones set the Yellow and Blue to -10. Import the couch by Tattoomaus78 image. Next, Use the Pen Tool (P) to cut it and remove it's background. Next you need to add some color adjustments so that the couch will blend in with the rest of the composition. For Levels use 17, 1.00 and 255; for Vibrance use Vibrance 21 and Saturation - 16; for Exposure -0.50, Offset 0.0000, Gamma 1.0; for Hue/Saturation change only the Saturation to -60. After you position your couch, Command-click on the "couch" layer to make a selection around it, then create a new layer above it. Now use a black soft brush to draw on the corners and edges of the couch. Then set the layer Opacity to 80%. Now you need to add some more shadows for the couch. First, create a new layer and place it below the couch layer. Next use the same black brush tool to add some spots behind the couch, and in the end set the layer's Opacity to 50%. Make another selection of the couch and create a new layer. Use the same technique as before to add some black spots on the couch. Also, use the Burn Tool (O) in some places, then in the end set the layer to Soft Light and Opacity to 90%. One last thing here is to merge these layers. Next, use the Transform Tool to change the shape of the couch a bit, just pull the right corners to make it look like a black hole is sucking everything in it's path. This step will be more interesting. So for this, you need to import some water into your document. Use the Waterfall by xPhate image. Use the Lasso Tool (L) to make a few selections of the water, then place them into your composition. In some cases, you will also need to use the Transform Tool (Command + T) and deform the pieces you import so that they combine and blend in nicely. After you place each piece in the right place, desaturate each piece of the water, then set them to Lighten and Opacity 80%, or just experiment and chose the settings you consider to work best for you. Also, in some cases you will need to use a soft Eraser Tool (E) and soften the water. Remember to use small parts of water like in the last image in this step. Position these pieces in places like the couch and floor, painting, the end of the painting, and the rest of the edges that look a bit strange and in need of some more water. You are actually recreating a waterfall in this step, and it can take a long time until you reach your goal. Now you need to work with another water image. This image will be used on the floor. Place the image in the composition using the Transform Tool, then you need to pull the lower corners a little so that there will be some perspective visible and desaturate the layer. In the end, set the layer to Screen and Opacity to 60%. Finally, use a soft brush for the Eraser Tool, and erase the lower left and right parts to make it blend in. Another good tool to use here is the Burn Tool (O); use this to darken some parts of the water. You can also play a little with the Saturation (-40) and Exposure (-0.40). It's time to add another object in the scene, which is the Vintage Mandolin. After you cut out the mandolin from it's original background, import the image into your composition and place it on the couch. Be sure to place it as though it looks like it's floating above the couch. Duplicate the "mandolin" layer and then double-click on it to enter the Blending Options. Here chose Color Overlay and set it to Black. Next move the "black mandolin" layer below the original one. Go to Edit > Transform > Warp. You need to modify the shape of the shadow a little so that it looks like it's morphing with the shape of the couch. Finally, go to Filter > Blur > Gaussian Blur and chose a 3px radius. Now set the layer to Overlay and Opacity to 60%. In the end, make the mandolin look as old as the rest of the objects in the composition. To do this, change the Brightness to -26 and Contrast to -8; Saturation to -44; Vibrance +26 and Vibrance Saturation to -8. Let's add another object, which is the pedestal. Cut it out using the Pen Tool (P) and then place it in you composition, behind the couch layer. Use the Burn Tool (O) set to a low Opacity, and draw over the pedestal to make it look darker. Another great technique to make objects look darker is to duplicate them, desaturate them, and then set the copy to Multiply. Now that you made your pedestal look darker, you need to create some cracks on it to make it look old. Now create a new layer and place it lower then the pedestal. In this layer, draw using a black brush and create something that looks like the shadow of this object. Apply a soft blur to the shadow, then set the layer to Multiply, and set the Opacity to 70%. One last thing you need to do to this pedestal is to add the cracks. Use the same texture and technique as you used for the wall. Also, use the Burn Tool if you consider some sports to be too light. Cut the second pedestal using the Pen Tool and then import it into your document. Resize, rotate and place it on the left side of the screen slightly going out of the document. Let's make its colors look the same as the first one. Change the Vibrance settings to +17, Saturation -35; Hue 0, Saturation -8, Lightness 0; Brightness -8, and Contrast -17. Same as you did with the first pedestal, you need to add the shadow and cracks. For the shadow repeat the same steps used for the mandolin shadow. To create the cracks, use the same texture and techniques applied to the wall and first pedestal. Time to insert another image in the composition. This time we will add a Bird Cage and later on you will also add the bird that actually escaped from the cage and flies straight for the painting attempting to escape into the real world. So after you finish cutting the cage out of its background, import it into your document and transform, rotate and position it in the top-right side of the image. Duplicate the layer and then double-click the new layer to enter the Blending Options. Now go to Color Overlay and set it to Black. In the end, set the duplicated layer to 50% and the original cage layer to 85%. Next you need to add some Adjustments to the cage. Set Vibrance +26 , Saturation -8; Levels 8, 1.00, 255; Hue 0, Saturation -30, and Lightness 0. One last thing to do is to create a gate for the cage. Using the Pen Tool, make a selection like in the image below. Copy it into a new layer, then use the Transform Tool to make it look like it is part of the cage. After you cut out the golf ball, import it into your composition. Now resize it and place it above the first pedestal. It will look like it's levitating above the pedestal Play around with the brightness/contrast settings and make it a little lighter. It is time to add the last object and that is the bird. Cut it out using the Pen Tool, then place it into the document between the painting and cage to give the impression we are looking for, which is the bird has just escaped from the cage and flies straight at the painting. Also, you need to duplicate the bird and move it somewhere over the couch. Also, fill it with black, apply some blur ,then lower the Opacity to 70% or lower. Doing this creates the bird's shadow. Next add some final adjustments to the bird. Set Levels to 20, 1.00, 255; Hue/Saturation to 0, -40, 0; Vibrance to +20, -30; Brightness/Contrast to 0, -30. It is time to start creating the break-apart effect. For this use the Lasso Tool (L) and select small pieces of the painting. For the moment, drag them a little (not too far though). Repeat this step until you get something like in the image below. Also, you can use a slash brush to make the effect more powerful. You can find some really great brushes at cgtextures in the splatter section. Continue creating the break-apart for all the elements. Look at the image below for reference. Also, use the splatter brush for greater effect. Use Topaz Adjust with the Portrait Drama effect. This will bring out more details in the image. Next use Adobe Lightroom and apply the settings from the image. Next you need to save the image as a JPG and open it in Photoshop. Duplicate the layer and go to Filter > Blur > Radial Blur, set it to 5px and Zoom. The last step is to create a layer mask, then use a black soft brush to mask some parts that are more important, like the center of the image and objects. If you want, you can stop at this point, but we will take you through the process of adding a really cool color effect. Open the JPG and darken the image a little by changing the Levels settings. Select the Green Channel and press (Command + A) then go to Edit > Copy. Select the Blue Channel and go to Edit > Paste and then select the RGB Channel. And final step is to create a new Adjustment Layer set to Curves and look at the image below for reference. Hope you learned some new techniques and had fun while doing so. You can view the final image below or view a larger version here.